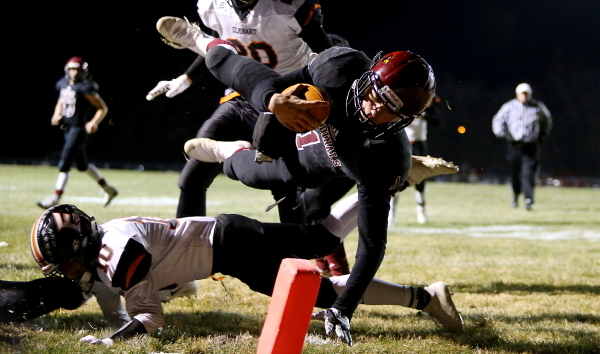 Kpreps.com would like to congratulate Everett Royer for submitting the winning photograph for Week 11 of the Kpreps Friday Night Photo Contest. Everett’s photo captures Plainville junior quarterback Jordan Finnesy diving for a touchdown in the Cardinals 28-13 quarterfinal victory over Elkhart. Finnesy passed for 119 yards and a touchdown in the game, but did most of his work on the ground with 100 rushing yards and two touchdowns on 30 attempts. Everett was also named the weekly winner back in Weeks 3 and 4, so this photograph provides him another photo that is eligible for our 2018 Grand Prize including $500 in cash. Each week during the regular season and playoffs, Kpreps selects one winning photograph that will become eligible to win the grand prize. Only weekly winning photographs will be eligible for the grand prize! Weekly winners will be featured on Kpreps.com.